Samsung Electronics and Habitat for Humanity announced today the renewal of a partnership focused on providing residents of low income areas in Bangka Island, Indonesia with home improvements, better access to clean water and sanitation, and enhanced vocational and educational opportunities. Aimed at improving lives, the program will benefit more than 2,000 people in the community. Located east of Sumatra, Bangka Island and a neighboring island are the world’s largest producers of tin – a vital component in electronics devices including mobile phones. Despite the island’s rich natural and mineral resources, illegal and hazardous mining practices have threatened the environment, with residents of Bangka Island challenged with various health risks. In partnership with Samsung Electronics, Habitat for Humanity Indonesia will implement a three-year community revitalization program in two Bangka Island communities. In Penagan village, new homes will be built for over 100 families, and better access to clean water and proper sanitation will be provided to 200 additional families. 300 people will receive training in basic construction, water and sanitation, and financial education, and 100 people will receive job and vocational training. In the Opas Indah village, a high-tech Samsung Smart Library will be constructed for the use of students and the community, where various training courses will also regularly be held. This project is in line with the local government initiative, the Adopting Social / Underserved Village (ADES) program, to enhance the quality of life of citizens. Since 2013, Samsung Electronics has been a member of the Tin Working Group (TWG), a voluntary multi-stakeholder initiative to address responsible tin mining issues in the Bangka-Belitung region. Samsung will continue to work with Habitat for Humanity to improve housing and hygiene and provide access to digital education in the area, with the project to roll out for the next three years, with a special USD 750,000 fund mobilized by the Samsung Electronics’ Employee Donation Fund. As part of the program, Samsung is currently supporting health and safety education programs for artisanal miners in the region. “Education is essential to all of humankind. Children, as the next generation, must be able to study and be provided all the resources possible to succeed. 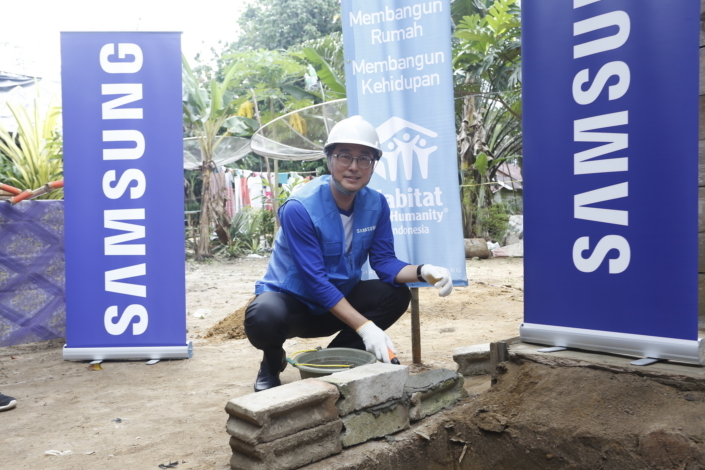 We appreciate Samsung’s commitment to partner with Habitat Indonesia and support low income families in Bangka Island,” said David Andre Ardhani, National Director of Habitat for Humanity Indonesia. Samsung Electronics and Habitat for Humanity have partnered together since 2013, supporting various projects in seven countries including Vietnam and Nepal. Earlier this year, Samsung and Habitat for Humanity completed a community development project in Rowosari village, Central Java, Indonesia which saw the construction of a Samsung Smart Library, community hall and the repair of 31 houses. Driven by the vision that everyone needs a decent place to live, Habitat for Humanity began in 1976 as a grassroots effort. The Christian housing organization has since grown to become a leading global nonprofit working in more than 70 countries. In the Asia-Pacific region since 1983, Habitat for Humanity has supported more than 2.4 million people to build or improve a place they can call home. Through financial support, volunteering or adding a voice to support affordable housing, everyone can help families achieve the strength, stability and self-reliance they need to build better lives for themselves. Through shelter, we empower. To learn more, donate or volunteer, visit habitat.org/asiapacific.